You don’t know what you’re doing sometimes. You just begin. 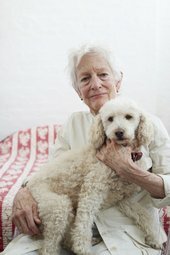 This is why Joan Jonas is so exciting! Joan Jonas is an American performance artist. She was born in 1936. Although she has been making art for over fifty years, she is a hero to lots of younger artists because her art is so daring and original. Performance artists perform (or get other people to perform) an action as their art. This could be a dance, movement, or another activity. Joan Jonas often draws pictures or makes things in her performances. Did she always want to be an artist? Joan Jonas Mirage 1976 performance at the Anthology Film Archives, New York, 1976. Photo: Babette Mangolte © 1976 Babette Mangolte. Growing up, Joan Jonas was surrounded by creative people. Her dad was a writer and read poetry to her. Her mum took her to the theatre and to art galleries. Her stepfather was a magician (how cool is that?) When she was five or six she knew she wanted to be an artist. Joan studied sculpture at art school. But in the 1960s she met experimental dancers and performance artists in New York. She decided she wanted to make a different kind of art. Getting the video camera enabled me to make my own little films in my loft. You could do everything yourself. And then I started incorporating video into the performance. She hasn’t stopped experimenting with video. For her artwork Beautiful Dog she fitted a go-pro camera to the collar of her pet poodle Ozu. In the video we see his experience of the world (even if it is sometimes upside down). Joan Jonas Stream or River, Flight or Pattern (2016 - 2017) © Joan Jonas : Artists Rights Society (ARS), New York : DACS, London. All sorts of things inspire Joan Jonas. She is interested in what makes us who we are. Her Mirror Pieces performances in the late 1960s used mirrors and reflections to explore how we see ourselves. She is also interested in the world around us. She often uses nature and the landscape in her work, and tackles big issues such as ecology and climate change. I rehearsed my work only at night, and when I rehearsed, I stepped into another space that was not the same as my everyday space. How did she develop her unique style? My work is all about layering, because that’s the way our brains function. We think of several things at the same time ... I think in a way my work represents that way of seeing the world – putting things together in order to say something.